Ontario Place is one of Toronto’s most fun and exciting tourist destinations. It receives around a million visitors annually who come to enjoy films (on the world’s first permanent IMAX theatre), fun rides and more. Ontario place amusement park in Canada also has a lot of activities geared towards children, thus making it a great family destination. The Ontario Place in Canada first opened in 1971 and was a very popular attraction. It received 2.5 million visitors that year. It underwent substantial transformation in the 1980s with the inclusion of features to make the amusement park a place for all. Although the numbers seem to have dropped since the opening of the Ontario Place, it is still one of Toronto’s major tourist attractions. 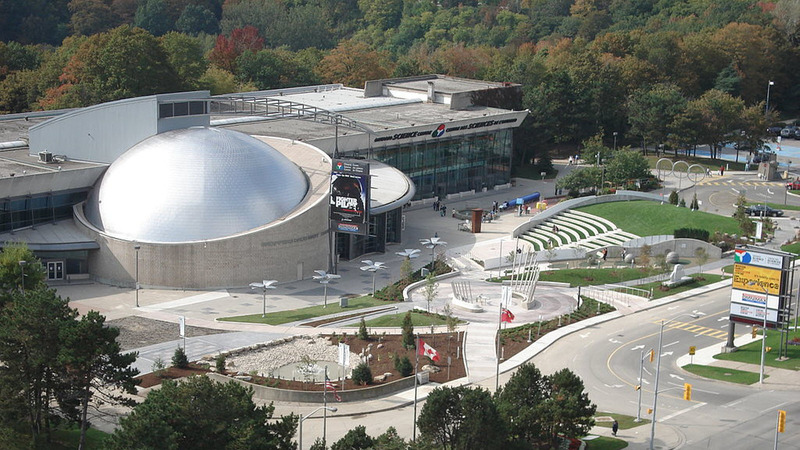 Ontario Science Centre(OSC) is a popular Science Museum in Toronto, Canada. Since its opening in 1969, it has received over 40 million visitors. It covers a variety of subjects and topics from sports, biology to astronomy. The centre also holds several science and technology programs for school groups from around the country. It receives more than 1 million visitors each year and more than 200,000 students. It also houses the OMNIMAX movie theatre from which you can watch films or view slide shows of various scientific demonstrations. The Alberta Legislature Building in Edmonton, Canada is the seat of the Legislative Assembly of Alberta. Its grounds are a popular spot for relaxation among the locals, especially during summer. The Beaux Arts style building has a large dome which can be seen several blocks away. The Alberta Legislature Building in Edmonton, Canada was built between 1907 and 1913 by the architects, Allan Merrick Jeffers and Richard Blakey at a cost of $4 million. The Montreal City Hall in Montreal, Canada was originally built in 1872, it was opened in 1878 and lasted 44 years before it was burned down by a large fire in 1922. 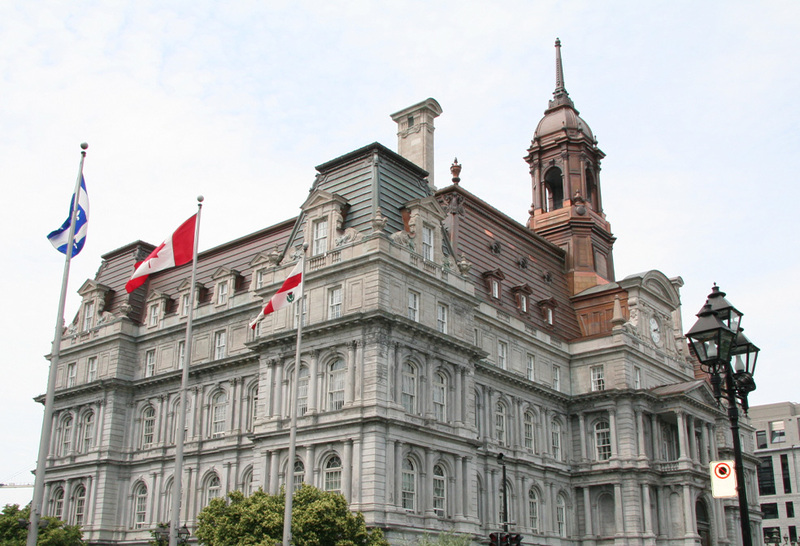 The present building was built in 1926 and currently serves as the administrative headquarters for the city of Montreal. This is where Charles de Gaulle, then president of France gave his famous speech ‘Vive le Qubec libre!’ (Long live free Quebec!) on July 24, 1967. The Niagara Sky Wheel on Canada side is one of the largest observation wheels in the world. It stands at a height of 175 feet (53 metres) above the ground. 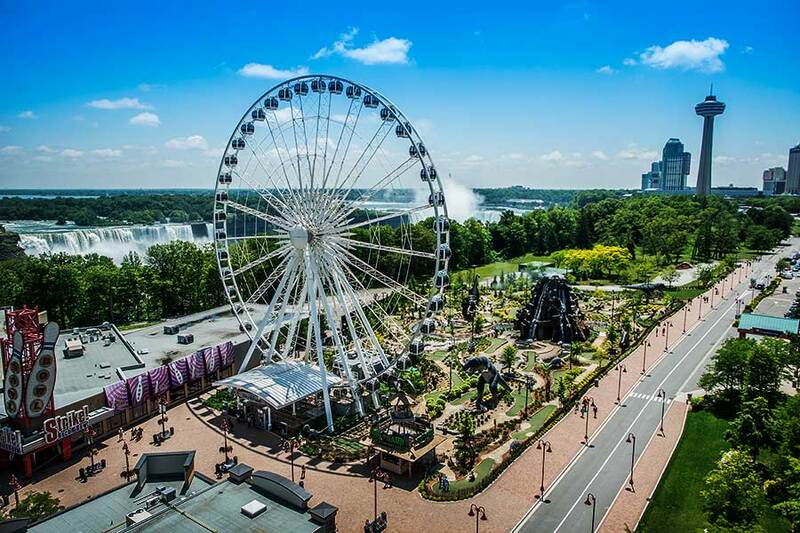 The Ferris wheel offers breathtaking views of the falls and the surrounding areas. It consists of 42 capsules, each taking a maximum of 8 passengers. Rides take around 12 – 15 minutes, the non-reflective glass of the passenger cars allows of incredible photographs during the day or night and especially during sunset. Maximum visibility is during the day though, but nighttime lets you see the beautiful lights around the area. The Niagara SkyWheel was completed in 2006 at a cost of $10 million, it was built as a replacement of the Falls Tower Ride. The Calgary Tower is a 191 metre (626 feet) free standing observation tower in Downtown Calgary, Alberta, Canada. Originally called the Husky Tower, it was conceived as a joint venture between Marathon Realty Company Limited and Husky Oil as part of an urban renewal plan and to celebrate Canada’s centennial of 1967. The tower was built at a cost of $3,500,000 and weighs approximately 10,900 tonnes, of which 60% is below ground. It opened to the public on June 30, 1968 as the tallest structure in Calgary, and the tallest in Canada outside of Toronto. It was renamed the Calgary Tower in 1971. The building was a founding member of the World Federation of Great Towers. When Marathon Realty and Husky Oil built their new head offices in Calgary, they proposed building the tower both to honour Canada’s centennial year of 1967 and to encourage urban renewal and growth of the downtown core. The structure was designed by W.G. Milne & A. Dale and Associates, and was designed to withstand earthquakes and winds of up to 161 kilometres per hour (100 mph). Construction began on February 19, 1967, and completed in 15 months at a cost of C$3.5 million. The column of the tower was built from an unprecedented continual pour of concrete. Pouring began May 15, 1967 and was completed 24 days later at an average growth of 25 feet (7.6 m) per day, a rate that was praised by industry officials as an “amazing feat of technical and physical workmanship”. The CN Tower is a communications and observation tower in Downtown Toronto, Ontario, Canada. Standing 553.33 metres (1,815.4 ft) tall, it was completed in 1976, becoming the world’s tallest free-standing structure and world’s tallest tower at the time. It held both records for 34 years until the completion of Burj Khalifa and Canton Tower. 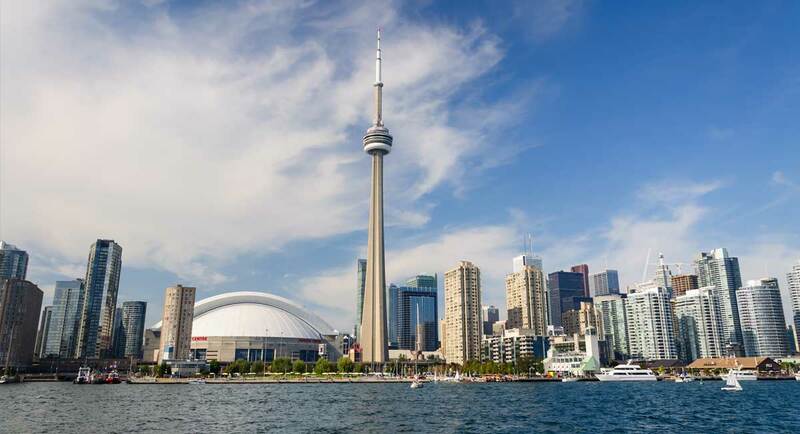 It remains the tallest free-standing structure in the Western Hemisphere, a signature icon of Toronto’s skyline, and a symbol of Canada, attracting more than two million international visitors annually. Its name “CN” originally referred to Canadian National, the railway company that built the tower. Following the railway’s decision to divest non-core freight railway assets, prior to the company’s privatization in 1995, it transferred the tower to the Canada Lands Company, a federal Crown corporation responsible for real estate development. Since the name CN Tower became common in daily usage, the abbreviation was eventually expanded to Canadian National Tower or Canada’s National Tower. However, neither of these names is commonly used. In 1995, the CN Tower was declared one of the modern Seven Wonders of the World by the American Society of Civil Engineers. It also belongs to the World Federation of Great Towers, where it holds second-place ranking. Stanley Park is a 404.9 hectare (1,001 acre) urban park bordering downtown Vancouver, British Columbia, Canada. It was opened in 1888 by David Oppenheimer in the name of Lord Stanley of Preston, the Governor-General of Canada. It is more than 10% larger than New York City’s Central Park and almost half the size of London’s Richmond Park. The park attracts an estimated eight million visitors every year, including locals and tourists, who come for its recreational facilities and its natural attributes. A paved 8.8 kilometres (5.5 mi) seawall path circles the park, which is used by 2.5 million pedestrians, cyclists, and inline skaters every year. Much of the park remains forested with an estimated half million trees, some of which stand as tall as 76 metres (249 ft) and are up to hundreds of years old. There are approximately 200 kilometres (120 mi) of trails and roads in the park, which are patrolled by the Vancouver Police Department’s equine mounted squad. The Project for Public Spaces has ranked Stanley Park as the sixteenth best park in the world and sixth best in North America. The Olympic Plaza is an urban park and gathering place in downtown Calgary, Alberta, Canada. Located around Macleod Trail and 7th Avenue S., it was created as the venue for the medal ceremonies at the 1988 Winter Olympic Games. In 2004, over 30,000 people packed the plaza to celebrate the Calgary Flames run to the 2004 Stanley Cup Finals. Olympic Plaza serves as a meeting place, and an outdoor event area, hosting concerts and festivals. In the winter, it is used as a public ice skating area. 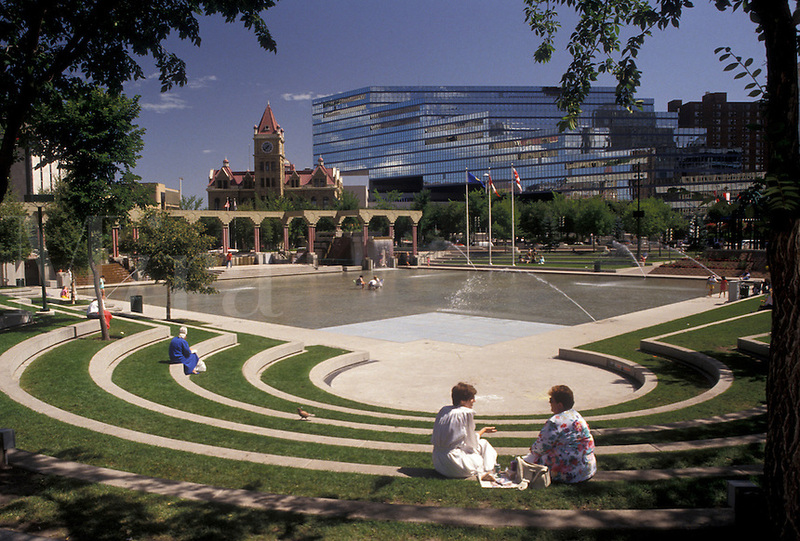 The plaza is accessible by Calgary’s C-Train system at the Olympic Plaza and City Hall stops.